Football has come to an end. And if you are a regular here at the Kings of Cork, you may know my opinion on the football season. There may be a possibility that ESPN Sportscenter will cover a baseball story soon (look at that, Baseball Tonight on my DVR. Play, play, play!!!). This means baseball is in the air so make sure you sign up for the 2012 Kings of Cork Home Run Derby reminder email list at the bottom of the sign-up page if you weren’t a member of the Derby in 2011. As I mentioned in my previous post, the quiet off-season on the Kings of Cork site doesn’t mean all the MLB off-season commotion will go ignored on the site. For the next few months, I will cover the off-season acquisitions that will have the most impact. The most impact on the MLB season. The most impact on the teams involved. The most impact on your fantasy and derby teams. So let’s step into the Acquisition’s Stadiums which will hopefully be more informative than a James Lipton interview. The Acquisition’s Stadiums are proud to welcome Prince Fielder. Why do the Tigers need Prince when they already have Miguel? Wow, was I wrong last February. The Cubs will be but the Tigers won’t be taking any chances this season. They went All-In in this offseason poker game with a $214Mil raise. By acquiring a HUGE bat, they aren’t going to let the Yankees or Rangers bully them any longer. They added a top-3 2011 MVP player to a team that already has the 2011 AL MVP in Verlander and a top-5 2011 MVP in Cabrera. The Tigers already had the 4th highest run producing offense in 2011 (only behind the RedSox, Yankees, and Rangers). But by adding Prince, they will not only replace the loss of V-Mart but bring in Cecil’s long lost fans. Still, the Tigers have some major offensive holes. There outfield is a mix and match of Delmon Young, Austin Jackson, Don Kelly, and Brendon Boesch. And no one knows who the DH will be (really, that should be Fielder). But I can’t wait to watch Prince tear up that short right porch in the Bronx. The AL Central is now the defending AL Central champs’ to lose. What does this mean for Prince? Prince is heading back to his childhood. Back to his memories of hitting the ball out of the Tigers stadium as a kid. Some people say how Miller Park is more home run friendly than Comerica, but that is BS. Sure Miller Park is typically slightly ahead of Comerica in HR power rankings, but both have been as high as 6th on the list and lower than 20th in the past 5 seasons. Prince will still bat with the MLB MVP in front of him (calling it right now, Cabrera is 2012 MVP) so his run production and pitch selection will be about the same. He does get the chance to hit chip shots out of more homer friendly parks (Camden, Yankee, and Fenway) but they aren’t directly in his division either. He also has to contend with a better ‘Fielder-shift’. Why will the shift be better in the AL? Typically, the defensive liabilities in the NL get to play 1B (*cough* Fielder *cough*). But in the AL, they get to play DH. Yup, they don’t even have to be in the field. So when Fielder tries to hit those laser beams past an immobile 1B, he won’t get quite as lucky has he may have in the NL. In the end, it doesn’t mean a whole lot for Prince. His numbers aren’t going to change a whole lot so he will still be a top-20 fantasy option with a new DH eligibility at some point this season. What does this mean for Miguel Cabrera? What this means is… Miguel Cabrera is the new #1 overall Fantasy Baseball Superstar (you already saw me give him the 2012 MVP award above). He’s the no doubter at the #1 draft pick. If he falls to 2 or 3 in your draft, you just got a steal. Why? Cabrera will not only be eligible at 1B, but most likely 3B. And he now has Prince protecting him at the middle of the line-up. As a result, his RBI, Runs, and HR totals are going to do nothing but increase. He’s going to get the opportunity to swing more often and at better pitches because pitchers won’t want to walk him to face Prince. I’m telling you… don’t hesitate at drafting Miguel if you get the opportunity. What does this mean for Boesch and Jackson? Austin Jackson and Brennan Boesch are going to benefit from Prince’s addition. Those two are projected to be the #1 and #2 batters in the Tigers lineup. This translates to them being the main beneficiaries to Cabrera seeing better pitches and Fielder’s raw power. That is as long as the two outfielders can figure out how to get on base. Austin Jackson is a career 0.271 batter and Brennan Boesch is a career 0.269 batter. Austin had 181 strikeouts which puts him in the top 25 for most strikeouts in a season (right along with my idol, Jose Hernandez). Austin still managed 90 runs and Boesch had 75 in 2011. I believe they will both top 100 runs this season because they will be told to watch a lot more pitches to try and produce base runners for the big guys batting 3 and 4. I also believe that Austin Jackson won’t top 20 stolen bases this season (he had 22 last year). The Tigers will be trying to keep as many base runners on base for Cabrera and Fielder, so limiting the amount of runners being picked-off means less opportunities for Austin Jackson. If you play in a league with OBP, Austin Jackson and Brennan Boesch are going to increase in value with Fielder coming into the lineup. Their OBP will rise, their run totals will rise, and the only decrease will be in Jackson’s SB totals. What does this mean for the Brewers? The Brewers are losing one of the players that redefined baseball in Milwaukee. The Brewers went from not finishing above 0.500 for 12 straight seasons to making 2 appearances in the playoffs in the past 3 years (Brewers fans rejoice). With Fielder leaving and trading LaPorta to the Indians for CC, the Brewers have a large pair of pants hole to fill at firstbase and in the clean-up spot of the batting order. Bring in Aramis. Aram will partially fill the hole at clean-up but could produce close to the same numbers if and only if he stays healthy and rebounds from previous years of disappointment. He definitely won’t be as robust as Fielder (Fielder has only missed 13 games in his career and only 1 in the past 3 seasons), but he had a higher BA and 40 less Ks than Fielder in 2011. Meanwhile, firstbase will need to be covered by some of the players mentioned down below. What does this mean for Ryan Braun? Ryan Braun is facing a 50-game suspension, but we won’t talk about that until the results are official (pending a recount of hanging chads). When Braun does get a chance to bat this season, he probably won’t get as many good pitches to hit. If I were a pitcher, I would rather take my chances against a struggling Aramis versus a guy on Horse Testosterone who was named NL MVP. Aram should still do a decent job of protecting Braun but I wouldn’t be surprised to see Braun’s all around offensive numbers drop a bit. He will still be an elite player, but losing the vegetarian slightly hurts his fantasy value. Lower HR, RBI, and BA even if he gets a chance to play in all 162 games. What does this mean for Mat Gamel and Corey Hart? Mat Gamel and Corey Hart are the pure beneficiaries on the Brewers organization losing Prince. Gamel rakes in minor ball (2011-28HR, 96RBI, 0.300+ minor career BA) but hasn’t found his stroke in the bigs. He will get the first opportunity in spring training to claim his first starting job in the majors. He’s a 3B by trade but like Braun, he is a defensive liability at the hot corner. So if you are looking for a late round flier, Gamel is worth a risk. If he finds that sweet stroke, you may be holding a trophy at the end of the season. Rumors are swirling as well that Gamel may be spelled of tough lefty pitching by Corey Hart. Hart was a disappointment last season after a huge 2010 campaign (26HR but only 63RBI). But if he gets that chance to gain 1B eligibility, his fantasy value increases. Multi-position eligible players are a gold mine. It allows you to meet the maximum games played at each position. Plus if the injury plague hits, they are usually a band-aid for a while the wound can clot. Let’s recap… Prince: Same player, different team, stats should transfer almost equally. 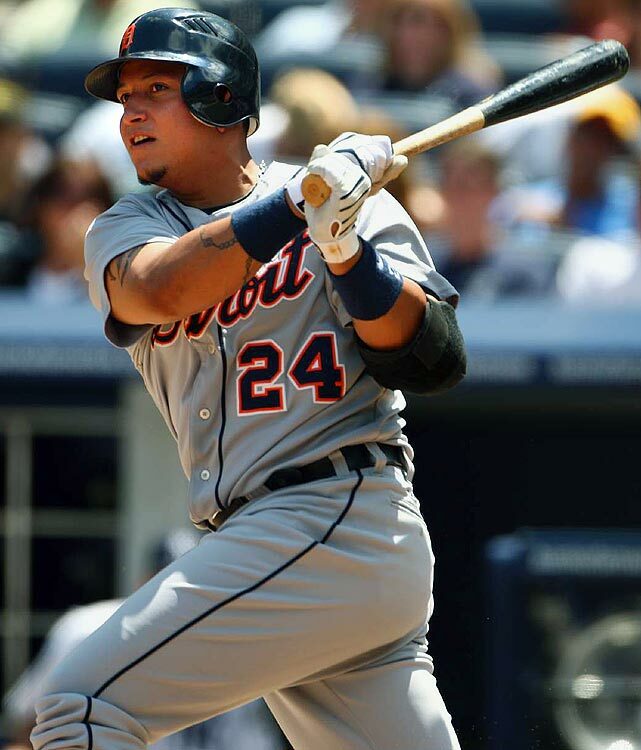 Cabrera: New #1 fantasy player, multiple position eligibility, HR/RBI/BA will spike. Austin Jackson/Brennan Boesch: Runs/BB/OBP will increase, SB drops. Braun: Hurt in everyway, HR/RBI/BA drops, still elite player, just expect a dip in stats. Gamel: Finally gets a full-time shot, power/BA is there, just needs to prove it in the Majors. Hart: Multiple position eligibility, increase in RBI back to 2010 numbers. Stay tuned for our next guest: Albert Pujols.